If you're feeling like your wardrobe isn't quite right lately, buckle up because I'm about to tell you about a book that I'm pretty confident can solve all your wardrobe quandaries! 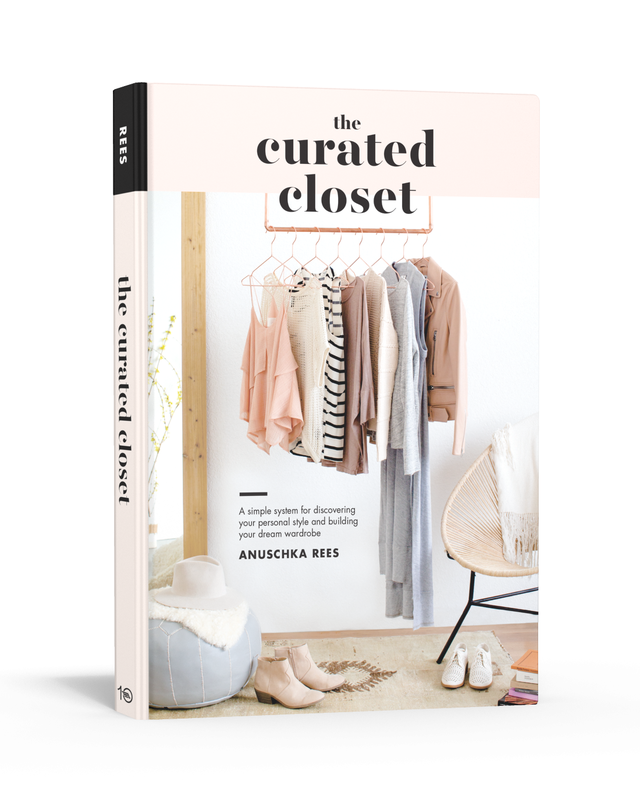 After a long, confusing link-clicking adventure through the internet, I somehow stumbled upon Anuschka Rees' book 'A Curated Closet.' When I first read about her book, I was just starting to learn about minimalism, intentional consumption and mindfulness. The idea of an intentional wardrobe really struck me so I immediately headed to my local library to pick up a copy and started scribbling down all kinds of notes. 'A Curated Closet' is all about figuring out your own sense of style, and then helping you to make that fashion dream a reality in a rational, organized way. Anuschka packed her book with tons of exercises, and being the nerd that I am, I followed each and every one. With her guidance I figured out that I had a huge discrepancy between what I actually wanted to dress like and what styles I tended to buy. I created my own style vision board, came up with some specific pieces and outfit formulas that represented that style and translated that into a concrete, prioritized list of items to buy. By the time I finished, I had done a lot of typing, a lot of Pinterest browsing and even more introspection. I think this book is amazing. The way you present yourself to the world, and the way you feel inside those clothes are truly powerful forces. The difference it makes to feel good about something so necessary (unfortunately pants are still required in public...) isn't something to brush aside while citing fashion as 'silly,' or 'frivolous.' The clothes we put on our backs really do affect us. At the same time, we live in a world where our clothes are usually cheap, trend-driven and dispensable. It's hard not to be sucked in by the idea that clothing isn't worth anything. 'A Curated Closet' did a great job of reminding us what all goes into a garment, why we should value our pieces and how we can get back to making smart, informed choices about what we buy and why. After reading this book and really taking to heart the planning techniques and structure Anuschka proposes, I can whole-heartedly say that I've had more days where I've left the house feeling amazing about my image than I've ever had before. The first season transition since I started implementing some of the lessons is just beginning and I'm armed with my short, well thought out list of pieces to be on the lookout for. I can't say enough about much this book has influenced my personal sense of style, the cohesiveness of my wardrobe and my relationship with the fashion industry. I highly recommend giving it a read before you head out on your next shopping trip.